DEVELOPMENT CLINIC with diagnostic and therapeutic facilities. At the development clinic we have facilities for developmental assessment of children from 0-6 years, intelligence testing for 6-12 yrs and screening and assessment for autism, behavioural abnormalities and learning disabilities. Tools used include DDST II, DASII, Stanford Binet test, M-CHAT, CARS, ESDM etc. We also run a neuro-developmental follow-up clinic for high risk newborns to pick up developmental problems as early as possible. Individualized programs are set up by a team of experts, for each child according to the problem identified and treatment/therapy provided accordingly. Every child is reassessed and advised every three months. EARLY INTERVENTION PROGRAM providing all necessary interventional therapy in an integrated manner. To prevent developmental delays in children at risk and to curb the progress of the disabilities already there, we resort to early intervention programs. Our specialized team of Physical therapist, Occupational therapist, Developmental Psychologist and speech therapist work together with structured, integrated programs. SPECIAL EDUCATIONAL UNIT for children with special needs, learning disabilities and behavioural problems. This special school now runs 5 days a week from 10:30 AM to 1:30 PM. Present student strength is 65. 60% of our children fall in the Autistic spectrum. We also have children with Cognitive delay, Downs syndrome, ADHD, behavioural problems and learning disabilities. We have 11 highly committed and well trained special educators and 9 care-givers constantly working with these children. The school provides scope for group learning, socialization, play and music, structured teaching for ASD, Yoga classes and pre-vocational training. Here we stimulate all-round development and help prepare them for streamlining to regular schools. The special educators work through play, songs, stories and various activities, as each child learns and grows according to his/her own ability. A lot of emphasis is laid on counselling the family. Parents need to be sensitized to the problem their child has and they need empathetic support to learn to cope with the situation. Parents are actively involved in the regular therapy procedures, for which a lot of grooming is required. So our team constantly works with the parents, as the child’s therapy continues. The problem of developmental challenge is graver among the under-privileged community, though they seldom seek medical help on their own. This prompted us to adapt a community based program, where we train a team of local women as care givers who can provide home based therapy to the affected kids. We also run screening camps to pick up the challenged children, fix therapy schedules for them and initiate the programs. They are followed up at home by the local care-givers, while we do a follow-up monitoring every 3-6 months. Our core focus is on Community Based Rehabilitation. All this is provided free of cost. Udbhaas organizes training programs and awareness programs for various groups of professionals and care givers. Our target groups include Pediatricians, primary physicians, school teachers, community based care-givers and parents. 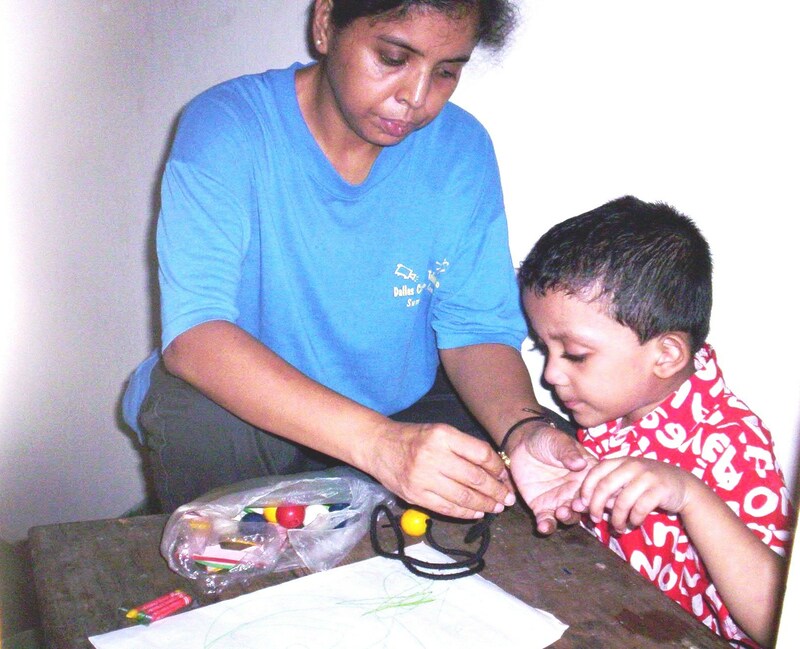 Udbhaas is actively involved in scientific research on Neuro-developmental problems in children. Much of this field-based research has been published at national and international levels. We have been invited to present our research work at various scientific conferences at San Francisco, USA, Dubai and Sri Lanka. I want to make an appointment to assess my 4 and 7 month old daughter. She has 12-14 word in her vocabulary, less eye contact and attention problem. Dhaka Bangladesh.